For those students who have completed the Shotgun Tactical Scenarios course during the day, learning to fight at night is the next step to develop mastery in the art of combat tactics. The night courses run from 6:30 p.m. through 12:30 a.m. Please plan on being at Front Sight from 6:00 p.m. until 1:00 a.m.
Front Sight`s night courses start in the evening before the sun sets. This allows a brief review of the skills learned during the prerequisite courses. As the sun sets and the light fades, you will be learning low-light techniques to get reliable hits on your target. Once the ambient light is gone, you will be using your flashlight to gain target identification, sight alignment, and sight picture. You will learn night-specific After Action Drills and malfunction clearances. The "Skill Builder" series of courses culminate in a skills test and do not have tactical exercises. The "Tactical" series of courses have numerous tactical exercises and scenarios and do not have a skills test. You must have completed an appropriate daytime course at Front Sight in the weapon you wish to use at night. Listed below are the courses which satisfy the prerequisite for each night course. 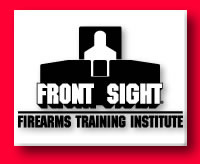 For the Handgun Tactical Scenarios course, Front Sight provides you with a Simunitions weapon. However, the Simunitions ammunition must be purchased from Front Sight`s Pro Shop. This is to ensure correct function of the weapon and, more importantly, your safety. For your comfort and hygiene, you must provide the appropriate protective equipment. This protective equipment is available for purchase at many retail locations as well as in Front Sight`s Pro Shop. For the Shotgun and Rifle Tactical Scenarios course, Front Sight provides you with a Simunitions weapon. However, the Simunitions ammunition must be purchased from Front Sight`s Pro Shop. This is to ensure correct function of the weapon and, more importantly, your safety. For your comfort and hygeine, you must provide the appropriate protective equipment. This protective equipment is available for purchase at many retail locations as well as in Front Sight`s Pro Shop. Ammunition (see table below). Please note that ammunition for Uzi and M-16 courses must be purchased from Front Sight`s Pro Shop. This is to ensure correct function of the weapon and, more importantly, your safety.